Setsubun, Japan's bean-throwing festival to celebrate the beginning of spring, is observed each year on February 3 during the Haru Matsuri (Spring Festival). Much like Lunar New Year celebrations around the world, Setsubun is considered a new start of sorts. It's a chance to get rid of evil spirits that bring sickness and prevent good fortune. And what are all evil spirits most afraid of? Not just any beans. 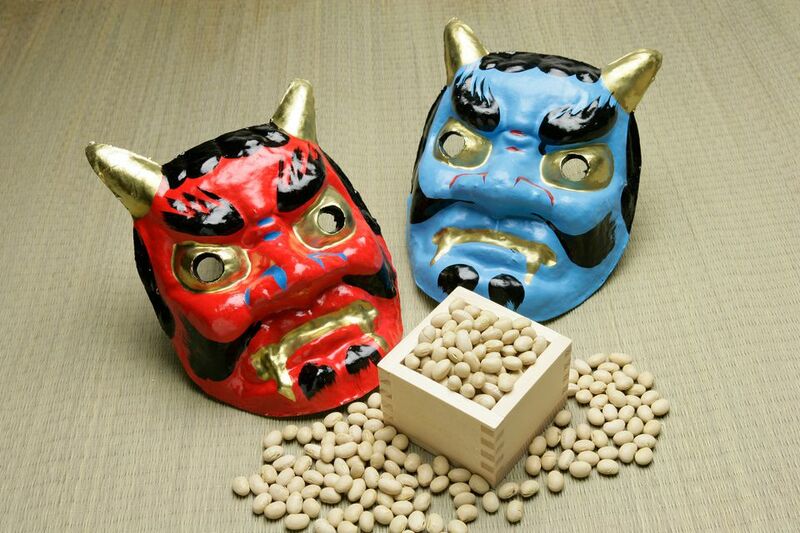 Roasted soybeans known as fuku mame (fortune beans) are thrown out the door in the direction of unsuspecting evil spirits—and sometimes a senior male member of the family designated to don a demon mask and play antagonist for the occasion. Setsubun celebrations have become fun, chaotic affairs in some cities. Crowds jostle and surge for beans (eating them is good luck), prizes, and freebies tossed from public stages—often by celebrity hosts. The events get televised, sponsored, and heavily promoted. As with many holidays, what was once a traditional ritual performed at home has become a very commercialized occasion. Shops sell masks and colorfully packaged soybeans during the season. Is Setsubun a Public Holiday? Although Japan's bean-throwing festival is celebrated in many variations throughout the country, it is technically not recognized as an official public holiday. Regardless, along with Golden Week and the Emperor's Birthday, Setsubun is considered an important festival in Japan. Throngs of people gather at Buddhist temples and Shinto shrines to pick up and throw roasted soybeans. They also visit shrines to pray for health and good fortune after throwing beans at home. Setsubun is celebrated publicly with fervor, but individual families may still carry out the tradition of mame maki (bean throwing) at home. If any male members of the family share the same zodiac animal as the new year, they get to play the ogre who wants to come in and cause trouble. If nobody's animal sign matches, the senior male of the household defaults to the role. The person chosen to play the part of an ogre or evil spirit wears a menacing mask and tries to come into the room or home. Everyone else throws beans at them and shouts, "Out with evil! In with fortune!" with both seriousness, and in the case of children, some giggles. Once the "demon" is driven out, the door to the house is slammed in a sort of symbolic, "get out and stay out!" gesture. After the official ousting of the ogre, children scramble to get in on the fun and wear the mask. Some families opt to go to local shrines to observe setsubun in a less commercialized fashion. If traveling during Setsubun without an opportunity to visit a family home, go to a neighborhood shrine to enjoy a quieter version of the holiday. As usual, have fun but don't interfere with worshipers who are there for more than just photo opportunities. Public bean-throwing ceremonies known as mame maki are performed during Setsubun with shouts and chants of "oni wa soto!" (get out demons!) and "fuku wa uchi!" (come in happiness). Modern Setsubun has evolved into sponsored, televised events with appearances from sumo wrestlers and various national celebrities. Candy, envelopes with money, and small gifts are also thrown to entice the frenzied crowd who surges and pushes to collect the prizes! Peanuts are sometimes thrown, but tradition calls for fuku mame (roasted soybeans) to be used. As part of the ritual, one bean is eaten for each year of life. In many regions, an extra bean is consumed for good measure to symbolize good health in the new year. The practice of eating the soybeans first began in the Kansai or Kinki region of south-central Japan, however, it was propagated around the country by stores that sell the soybeans. Once considered a sort of New Year's Eve in Japan, people have been celebrating some form of Setsubun in Japan since the 1300s. Setsubun was introduced to Japan as tsuina by the Chinese in the 8th century. Although not as common as throwing beans, some families still carry on the tradition of yaikagashi where sardine heads and holly leaves are hung above doorways to discourage unwanted spirits from entering. Eho-maki sushi rolls are traditionally eaten during Setsubun to bring good fortune. But instead of being cut into single-bite sushi pieces as usual, they are left whole and eaten as rolls. Cutting during the Lunar New Year is considered unlucky. Hot ginger sake is drank for its warming properties and good health. If strict traditions are observed, a family eats in silence while facing the direction that good fortune will come from in the new year; the direction is determined by the year's zodiac symbol. Older Setsubun traditions included fasting, extra religious rituals at shrines, and even bringing in outdoor tools to prevent ill-mannered spirits from rusting them. Geisha still participate in old traditions by wearing disguises or dressing as men when with clients during Setsubun.